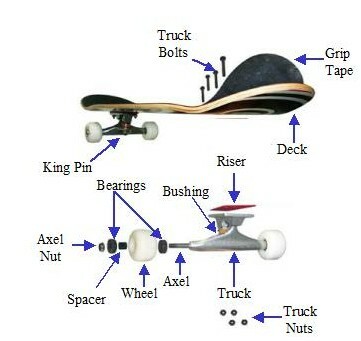 Most beginning skaters get a complete skateboard from a store and they are not really concerned with what the parts are that make their skateboard. They start to care when they have to repair it. They really start to care when they start becoming awesome skateboarders and realise that all those little parts actually either help you do what you want to to do or keep you from shredding the park like you want to. This article is like a guide to what the parts actually do. You can use the info you pick up next time you rework your skateboard or want to order a custom skateboard that will do what you want it to do. There are lots of good deck makers. They are usually made of wood and the biggest difference is size and shape. Shape is mostly just what a you like, but size in skateboards does matter. The reasons are you want a deck that is the right length for the skateboarder and the right width for the skateboarder's feet and what they like to do. This is a common chart used for helping people to buy the right skateboard length. 4 feet to 4' 10"
The width of the deck is usually between 7.5 and 8 inches. If you have big feet you want the wider deck. The other thing to think about is what kind kind skateboarder you are. A vert and transistion skater or spend a lot of time just riding around cruising you will most likely want a wider deck. If you are more into doing tricks then a narrower deck will work better for you.